Discover the cultural highlights, sweeping beaches and natural beauty of central Portugal. Cycle up the Douro Valley, ride a bike path to university town Coimbra then take a train to picturesque Aveiro. Spend the next three days following the Atlantic Coast, trying the excellent local wines and catch of the day. Arriving in Porto, we settle into our hotel and after an initial briefing with our Explore Leader, there will be the opportunity to head out for a short walk to see more. Portugal's second city straddles the River Douro and its atmospheric historic centre lies on the northern bank. The Port Wine lodges are located along the river in Gaia on the southern side. We leave Porto this morning after breakfast, travelling by train for nearly two hours to reach Pala where our first ride begins. There will be some time to ensure all are happy with our bikes and to make any minor adjustments. We then begin cycling and continue our journey up the Douro Valley, cycling on relatively quiet roads. Towards the end of our ride we enter one of the world's oldest demarcated wine regions - Porto and we start to see the famous terraced vineyards that have produced Port for over three hundred years. Our ride ends in Peso da Regua from where we drive for about an hour to Viseu and our hotel for the night. Set on a high plateau in the hills of Beira Alta, Viseu retains a medieval feel and has been an important crossroads since Roman times. Nowadays it is the centre of production of Dão wines. Our total cycling distance today is approximately 47 kilometres (total 800 metres accumulated ascent and descent). We cycle from the hotel after breakfast and ride our way to the start of the Ecopista do Dão cycle path. This beautiful cycle and walking path was made in 2011 by converting a railway line and we follow the entire route, with a downhill bias, to Santa Comba Dão. The first part runs along the banks of the river Dão, later leaving the river and running through landscapes covered with oak and chestnut trees with some vineyards and cultivated land. In the distance the mountains of the Serra do Caramulo (in the north) and the Serra da Estrela (in the south) are always present. At the end of the ride we travel by public bus to Coimbra - once the medieval capital of Portugal and home to the historic University. Our Explore Leader will take us on a walk through the backstreets and old quarter. Our total cycling distance today is approximately 49 kilometres (total 150 metres accumulated ascent and 550 metres descent). First thing today we catch the train to Aveiro - a charming town that is known for its canals, Art Nouveau architecture and colourful Moliceiros boats. We start our cycle along the colourfully painted beachfront houses in the Costa Nova neighbourhood. The surrounding area is a shallow coastal lagoon rich in birdlife and our cycle route takes us south on a longer route today, through the plains and marshland close to the sea. Finally we reach Figuera de Foz where we spend the night. Figueira sits at the mouth of the Mondego River and its extensive beaches of soft white sand meant that it has developed as a seaside resort as well as a fishing port. Our total cycling distance today is approximately 78 kilometres (total 310 metres accumulated ascent and descent). After breakfast we drive for about an hour to Alcobaça, allowing some time here to explore before starting our cycle ride. The 12th century UNESCO listed monastery is considered to be one of the finest examples of early Gothic architecture in Portugal. Today's cycle ride starts here and the first section follows the valley down to where it meets the sea at Nazaré. This seaside town has become famous among surfers for the monster waves, created by a trench close to shore, that can reach over 20 metres in height in the winter months when conditions are right. 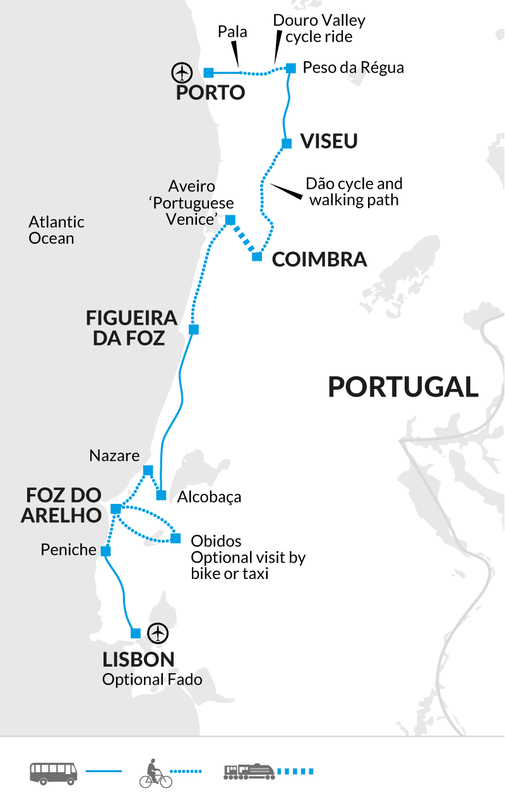 Our cycle route then follows the coast south to Foz de Arelho where we spend the next two nights. Foz de Arelho remains remarkably undeveloped and boasts a vast beach on the estuary, popular for windsurfing, as well as a great seafront beach just 15 minutes walking from town. Our total cycling distance today is approximately 48 kilometres (total 400 metres accumulated ascent and 330 metres descent). Today has been left free to explore or relax. We suggest a visit to nearby Obidos and it is possible to travel there by taxi or join the Leader on an optional cycle ride. Obidos is considered to be one of the most picturesque and well preserved medieval towns in Portugal. The town prospered after becoming part of the royal estate from the 13th century and within the walls you can visit the castle and lose yourself in the maze of narrow streets and little squares with fine examples of religious and civil architecture from the town's golden days. Our final ride is always close to the sea as we cycle south until Peniche, spectacularly set on a headland surrounded by the sea. The town remains an important fishing port as well as offering great beaches and surf. We will have some time to explore the walled historic centre where you can see the old fort where Salazar's regime imprisoned political prisoners only a few decades ago. We then drive for around 1.5 hours to Lisbon and the Leader will do a short orientation walk on arrival followed by free time to explore further. Resting on seven hills overlooking the estuary of the River Tagus, Lisbon became the capital of Portugal after its conquest from the Moors in 1147. As Portugal built a global empire Lisbon became the hub of international trade and the heart of this maritime Golden Age of discovery, reflected in the monumental architecture. A devastating earthquake and resulting tsunami almost totally destroyed the capital in 1755 and therefore Lisbon appears as a carefully planned 18th century city. Lisbon offers a good selection of restaurants to celebrate the end of our journey followed by the option to see a live performance of traditional 'Fado' music for those interested. 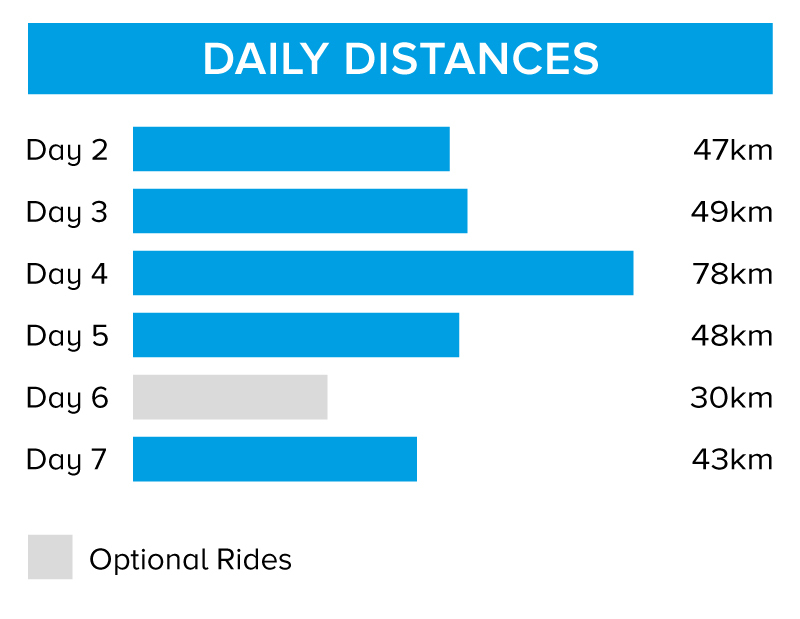 Our total cycling distance today is approximately 43 kilometres (total 490 metres accumulated ascent and descent). Our trip ends this morning in Lisbon after breakfast. On this tour we cycle 265 km over five days (an average of 53 km per day) with a further optional 30 km available. We generally cycle on quieter tarmac roads except on day 3 with a fine gravel cycle path. Day 3 is largely downhill whilst all other rides are in hillier areas with some short climbs and uphill sections. Each day a support vehicle (with room for 2 passengers) carries the luggage from point to point, accompanying the ride wherever necessary or possible. The cycle rides are not accompanied by a cycle guide, except on days 2 and 3 when the Tour Leader will cycle with the group. On the other days the Tour Leader drives the support vehicle and gives clear directions to follow the route. We have graded the route as moderate.